Relaxing. I stalk Jill Foster's blog and this tag is the result! MOOD WHEN DONE = A little Bing Crosbyish and don't tell me you don't know who that is. 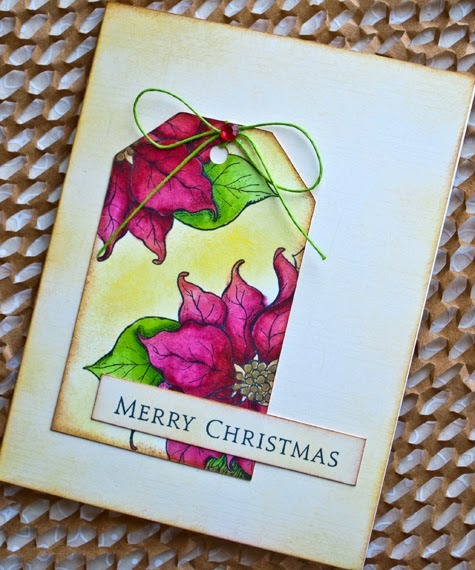 Oh, Joan, that poinsettia tag card is stunning! Do you remember all of the Bing Crosby Christmas specials? We watched all of the holiday variety specials. Gorgeous card Joan! Your coloring is perfection! I like the layout and the coloring is lovely! GORGEOUS! And I am going to put on my Christmas music today REALLY LOUD to drown out the "protests" of teenage boys! You color so beautifully, Joan! Happy Thanksgiving! And we heard Bing and Burl and Nat before the Junior High Show Choir concert last Saturday. It's not Christmas without them. Finding some time today to not just take a quick glance at my blog reader but to also leave some comments! This is beautiful, Joan - the colouring on the tag and also the lovely clean layout to display it. Do Unto Others...... Simple theme. Theme images by Jason Morrow. Powered by Blogger.